Smartphones started off as the coolest-looking tech gadgets to ever hit the market. When Apple unveiled the first iPhone, the industry was set on course to keep pushing the envelope while never compromising on design. Design-thinking is clearly at the forefront of the most successful smartphone companies today. Xiaomi, OnePlus, and even Google now know that the best way to beat out incumbents like Samsung and Apple is to design better-looking phones. Smartphones are, after all, simply a brick with a ton of computing power packed beneath a small, flat screen. Screens have been getting bigger over the years, but so have the phones that encase them. At this point, most new phones are so big that they’re a few inches shy of being labeled a phablet or mini-tablet. The amount of real-estate smartphones take in your pocket and within a phone case has been exponentially rising over the years. The only way to push the design is to make the screen much bigger without bulking up the body. Perhaps the best way to achieve that is to ditch the bezel. Bezel-less phones are nothing new. They’ve been around since Samsung started experimenting with the Galaxy S6 Edge in late-2014. It was the start of a bezel-free revolution, but over the past few years we’ve only seen a select few bezel-free phones. This includes Xiaomi’s heroic attempts – Mi Mix and Mi Note 2 – and Samsung’s ill-fated S7. 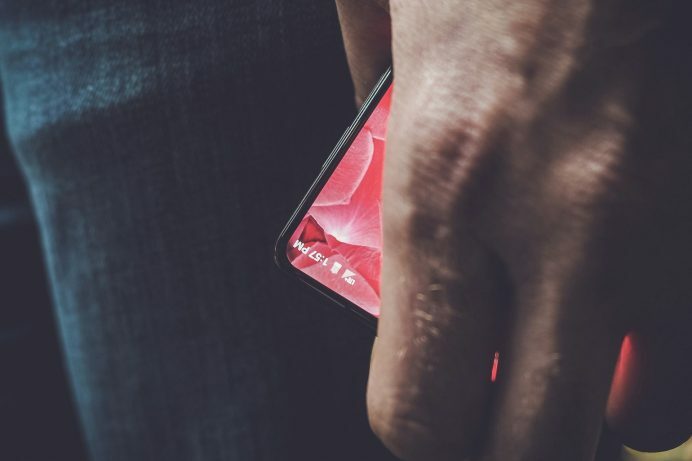 A teaser from Android founder Andy Rubin showed us a clearly bezel-free concept for his upcoming Essential’s smartphone. Although Rubin offered only a glimpse of the phone, if the body turns out to be completely devoid of a bezel, it’s safe to say his new startup is on trend. Bezels are notorious for being the ugliest part of the modern phone. While the rest of the front keeps evolving – getting sharper and more interactive – the top and bottom layers have been little more than dead-space. Yet, bezels are still a necessity for many smartphone users. These chunks of dead space offer users a point of friction so they can hold the device comfortably without knitting random points on the screen. Bulky, clumsy human fingers are holding the industry back. For now, getting rid of the bezel is more about style and less about functionality. There could be a software work around for this issue. Sophisticated operating systems could, in theory, identify your fingers and make it easier to use a bezel-free screen without accidentally hitting something you didn’t intend to. Considering the world’s biggest tech companies are working hard to solve this problem, expect to see bigger screens, compact phones, and less bezels in the near future.